Winged viviparae are similar to apterae, but with the head and thorax darker, and less prominent setae on the abdomen. The two images below show an apterous adult Eulachnus rileyi in alcohol. Under the wax the colour varies from dark olive green to orange-brown or grey. The orange-brown form is shown below in the early stages of gaining its wax coating. The characteristic blue-grey colour of Eulachnus rileyi is only present after the wax has built up after each moult, as in the case of the mature alate shown below. Unlike most Eulachnus species, Eulachnus rileyi is sometimes attended by ants. 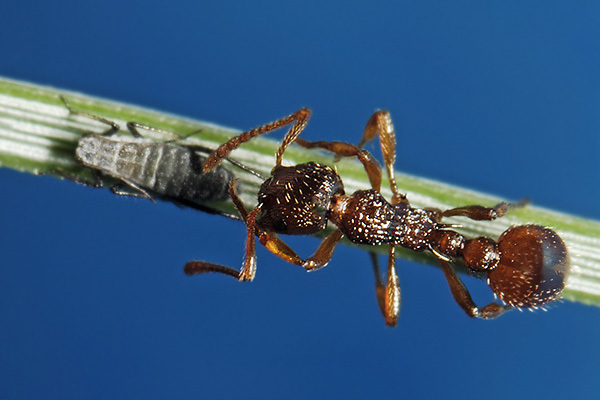 We have observed them being attended by Myrmica ants (see picture below). Tending involves a vigorous stroking by the ant's antennae. There were various potential predators active among the pine needles (see picture below) which may (or may not) have been deterred by the presence of the ants. Loyttyniemi (1979) found Eulachnus rileyi heavily infesting species of pines in a survey in commercial forest plantations in the Copperbelt Province of Zambia in 1978. It was subsequently found in pine plantations and on shade pine trees throughout the Southern, Central and Luapula Provinces. It was found on all of 7 species of pines examined, but was especially abundant on Pinus kesiya, Pinus merkusii and Pinus oocarpa. The aphid was not found in Zambia in a survey in 1974-75, suggesting that it may have entered the country and spread recently. It has not been reported from the Tropical Region before. Observations in Zambia showed that Eulachnus rileyi continuously produces overlapping generations of apterous viviparous females, winged females also being present at all times of the year. In 1978 and 1979, the build-up of populations was rapid in May-June after the rains had ceased, and the onset of the rains caused a drastic decrease in population density in November-December. Some coccinellids, especially species of Cheilomenes (see picture below), occurred abundantly and preyed on the aphid. The aphids fed on the needles, and all age-classes of needles were attacked at the same time. Infestation was easily detected in the dry season from the copious honeydew produced. Even under heavy infestation, yellowing of the foliage was seen only in the second-oldest whorl of needles; no premature needle cast occurred, and the aphid may therefore be regarded not as a major pest. In Zimbabwe Katerere (1983) reported that Eulachnus rileyi had become very widespread in exotic pine plantations in Zimbabwe , since its first appearance in 1980. However, Entomophthora planchoniana maintained effective natural control in both a Pinus kesiya seed orchard and a Pinus taeda plantation. Fungal development appeared to have been favoured by the onset of moist conditions when the aphid population density was high. Katerere (1984) studied the biology, ecology, and population dynamics of the pine needle aphid in the pine plantations of Zimbabwe. The annual cycle is simplified by the suppression of the sexual cycle, parthenogenetic reproduction occurring throughout the year. The aphid numbers were observed to increase substantially between June and July, and between September and November. Heavy rainfall was an important mortality factor. 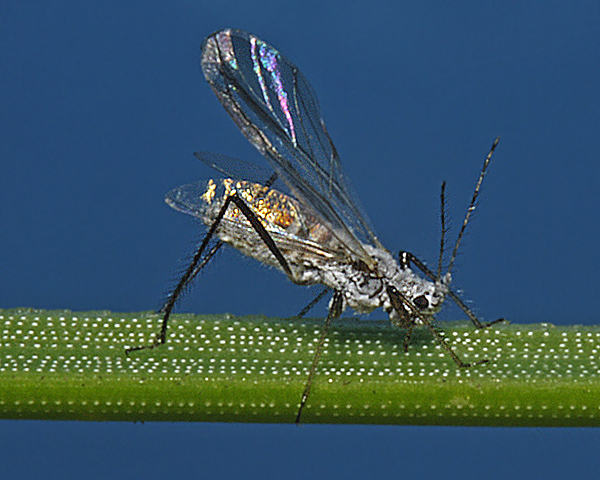 The pine needle aphid was found to prefer feeding on year-old and old foliage. 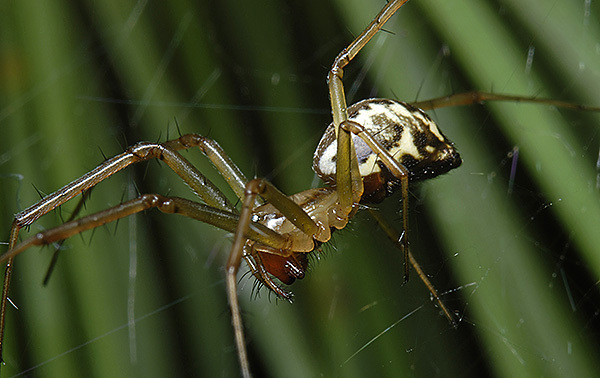 Eight species of predatory insects feeding on Eulachnus rileyi were identified. 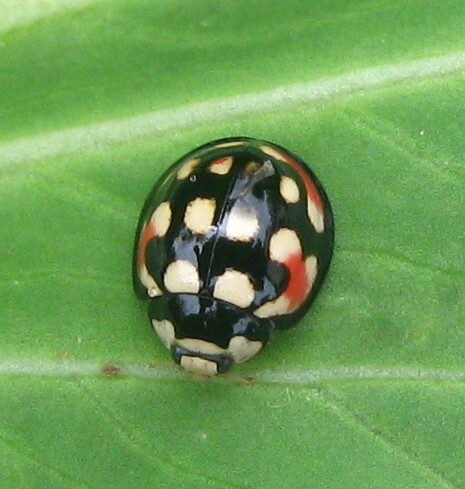 Coccinellid beetles were the most abundant predators. Hoverfly larvae, although not as abundant as the coccinellids, were found to be fairly important. 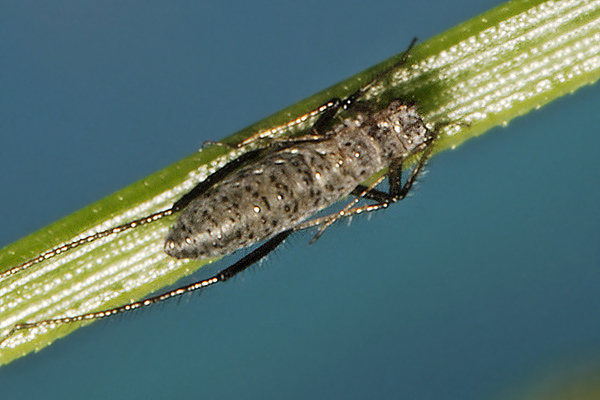 The fungus Entomophthora plachoniana was found to maintain effective natural control of the aphid in two separate areas. Ants tending the aphids for their honeydew were infected by the fungus Stilbella burmensis. 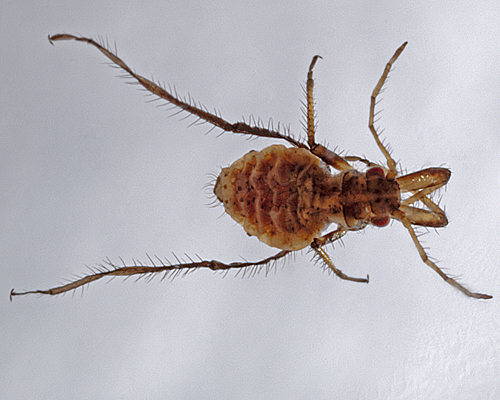 Abdullah & Mohammad (1991) looked at the seasonal abundance and population density of pine aphid, Eulachnus rileyi (see picture below) on pines in Hammam Al-Alil region, Iraq. 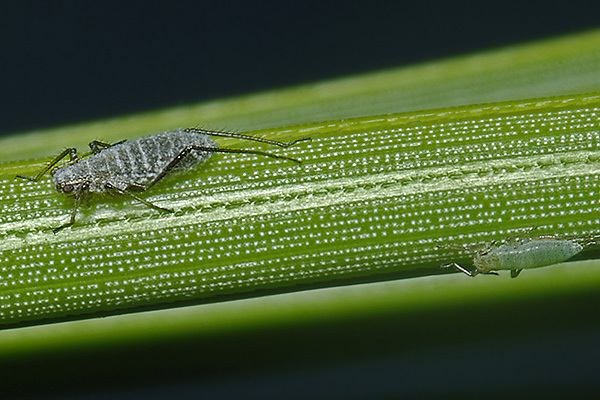 In 1987-89, small numbers of aphids appeared at the end of March, peaked in the 4th week of April and then decreased gradually until they disappeared in the 3rd week of June. There was a positive significant correlation between aphid numbers and temperature during the period of increase. 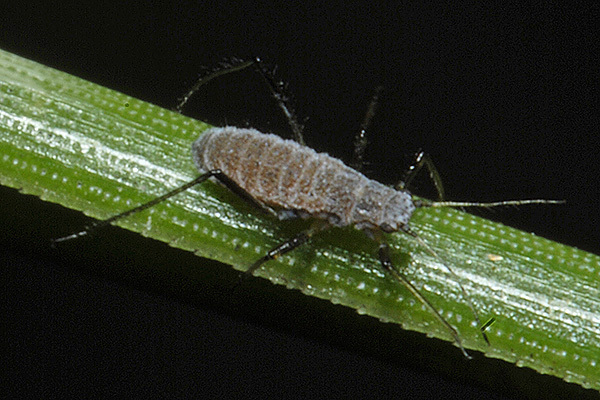 The aphid was absent in 1988, possibly due to rainfall intensity in winter. 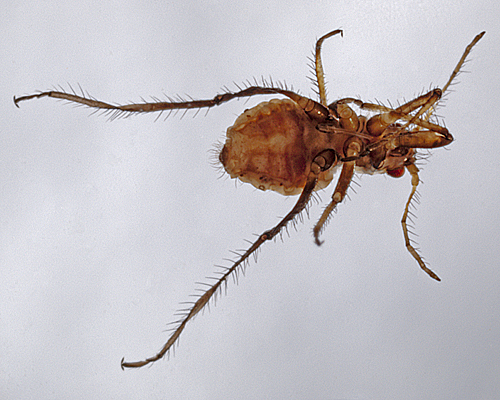 Rosales & Cermeli (1995) discussed the spread of the recently introduced aphid, Eulachnus rileyi, since its detection in Venezuela in January 1988 and outlined the threat to an area of 500‚000 ha of Pinus forests. Severe to moderate damage was observed in small plots for seed production, but not in commercial plantations during the dry season. In the rainy season, aphid populations decreased drastically due to biotic and abiotic factors, particularly native natural enemies. Kanturski (2016) attempted to predict the risk of invasion of Eulachnus agilis, Eulachnus brevipilosus and Eulachnus rileyi on a global scale using ecological-niche modelling. They obtained models of potentially suitable habitats, based on climatic variables and distribution of host plants, suggesting that favourable conditions for each species may be present on every continent. However, Eulachnus agilis and Eulachnus rileyi were potentially the most widespread species. In Europe, models showed that the potential distribution of the representatives of the genus Eulachnus overlapped with that of the host plants. 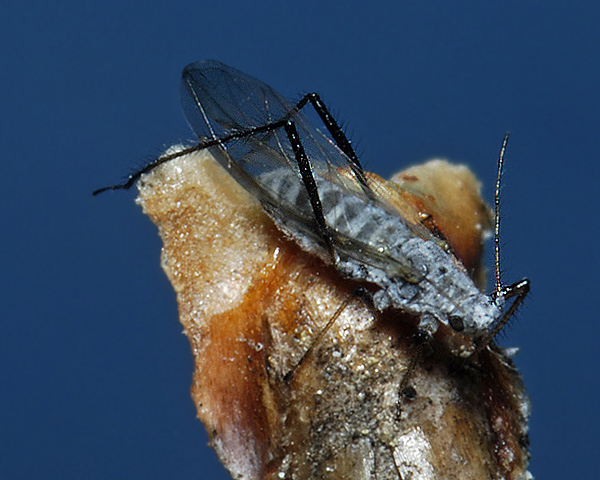 In places where they have been introduced, these aphid species have readily adapted to indigenous or introduced pines, including trees grown commercially for timber. Annual mean temperature and mean temperature of the coldest quarter were the most important environmental variables restricting the expansion of the species under investigation. 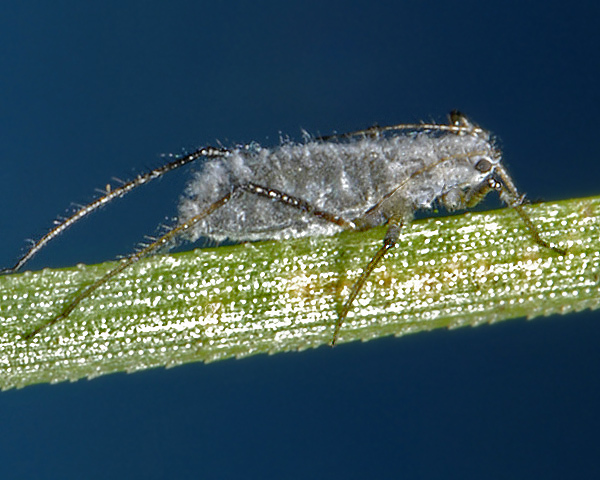 The most important factor in the decrease in population density of the feeding aphids is the rainy season and, on a smaller scale, the presence of their natural enemies. Eulachnus rileyi has been recorded from 34 Pinus species. We have found several different species of aphids cohabiting the same pine needles as Eulachnus rileyi, especially a newcomer to Britain, Essigella californica (see picture below - Essigella is the smaller, green, aphid). 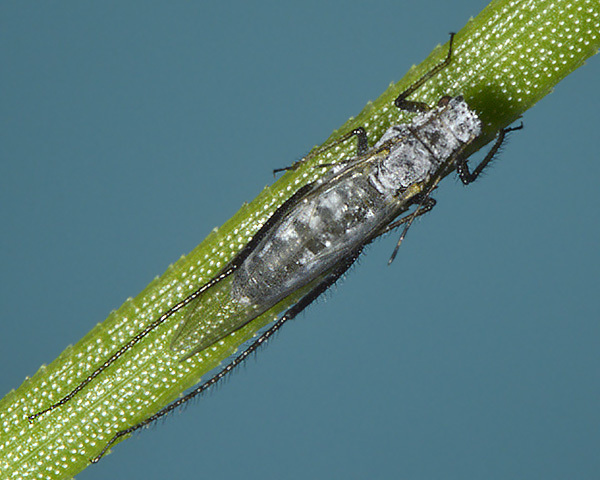 Feeding by Eulachnus rileyi (see picture below of an alate aphid) causes a characteristic mottling and yellowing of the crowns of affected trees. Black sooty moulds also grow on the honeydew that the aphids excrete. Nevertheless is not usually considered to be a serious pest within its native geographical range. In areas outside its native range , especially in eastern and southern Africa, it is a different matter, although no control programmes have yet been initiated. Murphy & Volkl (1996) reported on several aspects of the ecology of the specialist parasitoid Diaeretus leucopterus conducted on Eulachnus agilis in Germany in 1993-94, to provide a more scientific basis for judging its potential for use in biological control of Eulachnus aphids. Parasitism of all instars in the field rarely exceeded 10% and was independent of host density. A high percentage of parasitized aphids were hyperparasitized. Measurements of the impact over 16 weeks in a greenhouse-release experiment showed that parasitism rates increased from 2 to 19% but were insufficient to suppress the aphid population below a damaging level. There was evidence of a density-dependent response. Studies on foraging behaviour showed that female parasitoids searched pines by quite extensive walks. 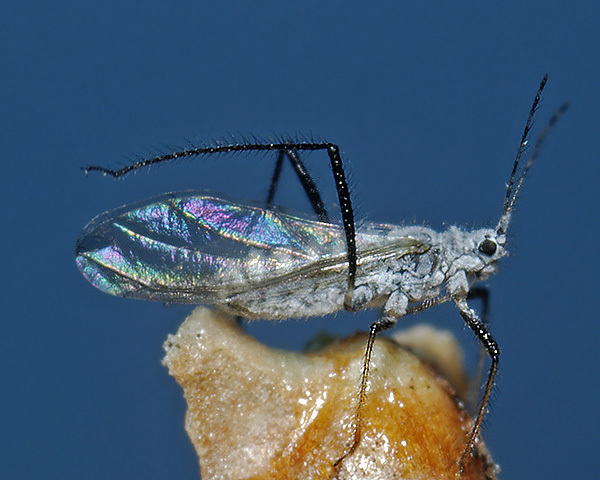 There was no relationship between the number of aphids per tree and number of ovipositions The majority of encountered aphids did not respond to the parasitoids. However, female parasitoids attacked a much higher proportion of aphids that did respond, but oviposition success on this group was poor. 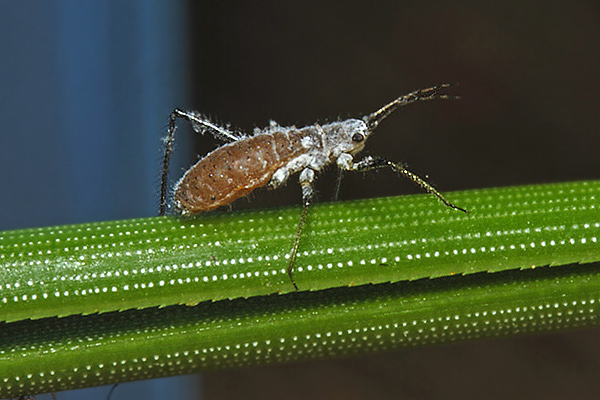 The number of aphid-infested needles on seedlings increased significantly owing to the parasitoid's foraging activity. On the basis of these results, it is suggested that Diaeretus leucopterus is only likely to be of benefit in biological control if used in conjunction with other complementary natural enemies.